This volume collects the story of The Tablet of Destinies. As the title alludes, we are getting ready to set forth on an Indiana Jones style adventure. 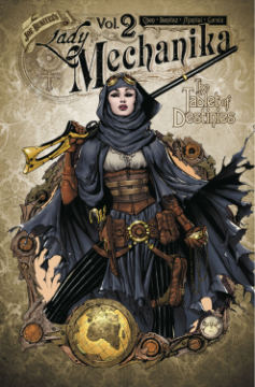 Secret societies, cryptology, imperial territory, dirigibles; all the perfect tropes for Lady Mechanika to go on a Victorian adventure to, the dark continent ... Africa! Mr. Lewis returns as Lady Mechanika's steadfast, if inebriated, mechanic, inventor, mad genius extraordinaire. The good doctor has vaguely vanished and been replaced with an archaeology professor on a quest for whatever secrets archaeologists are hoping to uncover. Of course, they end up finding it and it ends up being cataclysmically horrific. Then enter the secret societies and cryptology and you have another smashing adventure with Lady Mechanika. While everything is an overdone stereotype in this series, I like it's over the top nature and honestly found a compelling revelation at the ending. These comics have some substance underneath all the pomp and steampunk. I also really enjoy the art and typeface.